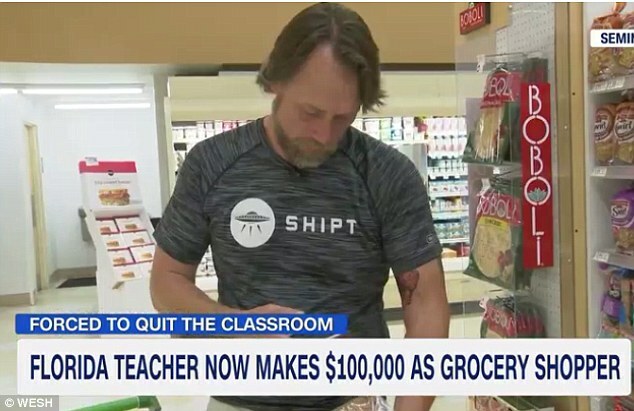 A Florida teacher has doubled his salary by quitting the classroom to become a professional grocery shopper earning $100k a year. Ed Hennessey, 45, spent 20 years of his life teaching students at Oviedo High School, but always had to work extra jobs at Blockbuster, Old Navy, Target and later Uber to support his two children. He joined Shipt part-time in 2015, had some success building up a customer base, and then took a year-long sabbatical to shop full-time two years. Last month, he gave up teaching for good. 'It's so relaxing, I get to go out. I see people, I'm my own boss - I am what I want to be,' he told Wesh 2. Hennessey puts in 50 to 60 hours a week, without the advantage of the school summer holidays. Hennessey said he never wanted to leave teaching, which he described as the 'best time of his life', but did not have a sufficient income when his salary never topped $50,000. Working for Shipt involves fulfilling orders which customers send through an app, which sends a shopping list to his phone. The app pays him a flat rate for the trip, plus an extra percentage based on the local area rate. Customers are also able to tip.